Scientists and government officials met at the United Nations today to consider possible solutions to a global problem: how to protect whale species in their most important marine habitats that overlap with shipping lanes vital to the economies of many of the world's nations. The event titled "At The Crossroads: Global Shipping Lanes and Whale Conservation" is part of the 2017 IUCN/WCS Knowledge Dialogue Series that will promote discussions among various stakeholders on international sustainable development challenges. This preparatory conference will feed into important decisions made by delegates on oceans and marine issues at the upcoming UN Oceans Conference on June 5-9, 2017. "Most species of great whale are affected by shipping activities in the form of potential ship strikes and underwater noise," said WCS President and CEO Dr. Cristián Samper, who provided welcoming remarks for the event. "The challenge of finding solutions on how best to protect these marine mammals in busy waterways is a global one, and international collaboration is the key to formulating effective solutions. Today's discussions on this issue are timely and will help pave the way for a formal call to action by UN delegates in June." Samper was joined by His Excellency Peter Thomson of Fiji, President of the 71st Session of the UN General Assembly and a panel of experts from government agencies, scientific organizations, and the shipping industry. The event was organized by the Government of France, the International Union for Conservation of Nature (IUCN), and WCS (Wildlife Conservation Society). Most whale species are still recovering from the impacts of centuries of commercial whaling and, although largely protected by a global commercial whaling ban, are now threatened by a host of new dangers, including collisions with ocean-going vessels, ocean noise, entanglement in fishing gear, and other factors. Moderated by Dr. Greg Silber of the U.S. National Oceanic and Atmospheric Administration, the panel discussed the scope and scale of impacts of the shipping industry on whales, focusing specifically on the threats of collisions and increasing low-frequency noise levels from commercial ships. The participants then reviewed a number of case studies from regions around the world—Africa's Gulf of Guinea, Sri Lanka, Chile, Arctic waters, and seascapes along the Atlantic and Pacific coasts of the United States—as a means of assessing the current state of knowledge on the overlap between shipping networks and biologically important areas for whales. Panel members also discussed new technologies, emerging research and management needs, and the importance of identifying best practices for balancing the needs of shipping and whale conservation objectives. "We have a real opportunity on the global stage this week and in the coming months to work with governments, industry, and conservation organizations to secure concrete actions that will benefit whales and the marine environment," said Dr. Howard Rosenbaum, Director of WCS's Ocean Giants Program and a panel participant. 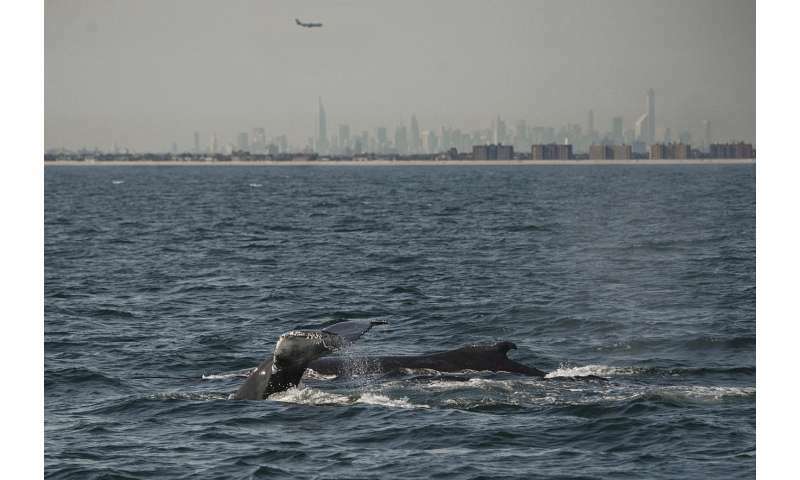 "Collectively we have been evaluating impacts from ship-strikes and noise for several decades, with some clear strides made in reducing impacts," said Dr. Brandon Southall, President and Senior Scientist for SEA Inc. "But now is the time to push forward using powerful new monitoring and mitigation technologies, and building new international partnerships like those forged here in New York."